During the discussions on the performance of the 2015 state budget, which were launched in the National Assembly this week, the country’s chief treasurer said that instead of 4.1 percent, predicted in 2015, 3 percent growth was recorded. That growth, according to him, was mainly due to agriculture and mining. Armenia’s Deputy Finance Minister, Chief Treasurer Atom Janjughazyan said that the economic growth amounted to 3 percent, as it has suffered from adverse economic developments of Armenia’s main partner countries, from the decline in international metal prices, from the reduction in real disposable income, which was due to the decline in the inflows of funds from Russia, as well as from the decline in lending rates in the economy. “In comparison with 2014, a 3-percent increase of GDP was registered in 2015. The economic growth was contributed by agriculture, industry, services, whereas construction had a negative impact – by 0.4 percent. All the commitments taken on by the 2015 state budget were fully and duly met,” said the chief treasurer, adding that the budget deficit in 2015 rose to 4.8 percent of GDP, compared with 1.9 percent of last year. Janjughazyan said that end consumption has also been reduced, decreasing by 6.5 percent over last year. Capital investment fell by 5.1 percent due to an 8.9-percent decrease in private investment, while public investment has increased. Wages have increased by 7.8 percent: by 8.8 percent at the state level, and by 6.6 percent at non-governmental institutions. Unemployment made up 18.5 percent. Budget revenues in 2015 amounted to about 1.2 trillion drams (over $2.5 billion), whereas about 1.4 trillion drams (over $2.9 billion) were spent. Foreign trade fell by 20 percent. At the end of 2015, Armenia’s state debt amounted to about $5.8 billion, which makes up 41 percent of gross domestic product. “Armenia is still among the countries with the smallest debt. From this view, the state debt still has not any risks in it, which, of course, does not mean that we do not discuss or do not consider the potential risks associated with the state debt,” said Janjughazyan. According to Artur Javadyan, the head of the Central Bank of Armenia (CBA), the financial indicators of Armenia are within manageable limits. According to him, a sharp increase in the budget deficit in 2015 contributed to an increase in costs, which has helped to sustain economic activity. “In 2015, the CBA spent 76 million drams for the maintenance and operation of the service cars. A much more respectable sum of money was spent on the construction of buildings and structures: 2 billion, 547 million drams (over $5.3 million). The money was spent on the construction of a cash center in Sisian, a reception home and school construction in Dilijan,” said the CBA governor. Earlier this month the government announced that it was adopting a policy of reducing administrative costs and optimization. In particular, it has already announced that 800 cars registered as service vehicles will be reduced within the framework of the campaign. 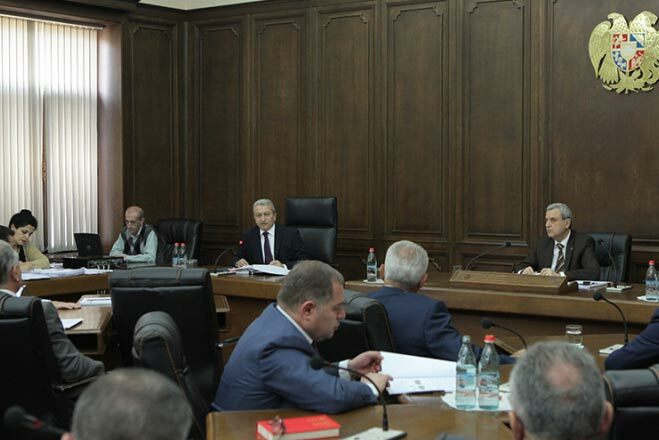 Deputy Chairman of the State Revenue Committee Armen Alaverdyan said that this reduction will provide an opportunity to save money on maintenance costs.